The Great Netherlands-Russia Book is a joint educational project between Holland’s Fontys School of Applied Science and Lomonosov Moscow State University's School of Journalism. It involves six Russian students and their six Dutch counterparts. 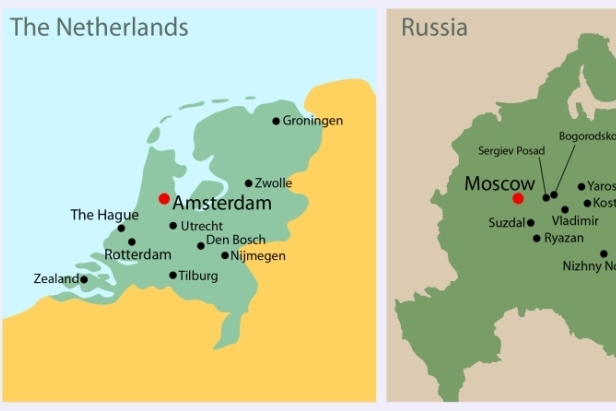 The Russian students came to the Netherlands in summer 2012, while their Dutch counterparts visited Russia in the fall. During a 10-day trip, they visited a range of cities and landmarks in Holland and in Russia. While their Dutch peers traveled around Moscow and the Golden Ring cities with Russian guides, students from the Netherlands escorted their Russian counterparts around Amsterdam, Tilburg and other cities. As a result, they cretaed a hardcover book, written in three languages – Russian, English and Dutch.